Mission: Impossible II is an action spy film that was released in theaters in 2000. The film stars Tom Cruise, Dougray Scott, Ving Rhames and Thandie Newton. 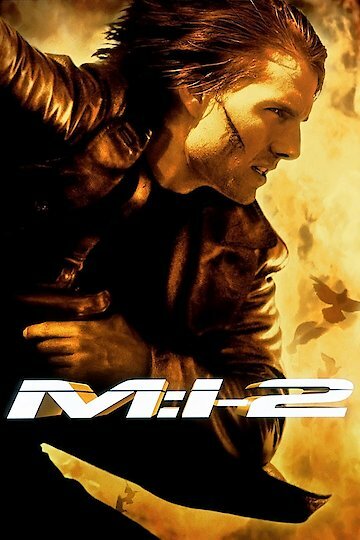 Mission: Impossible II starts with Ethan Hunt, played once again by Tom Cruise, being told that his identity has been falsely used to crash a plane carrying a renowed Russian chemical scientist to the United States. The IMF, Impossible Missions Force, was originally told he was going to arrive because of their concern that a virus called Chimera was being sent over, along with its cure named Bellerophon. However, since the plane crashed everyone is now worried that the virus was released and out in the public, and that a rogue agent named Sean Ambrose, played by Dougray Scott, is responsible. Fearing for everyone's safety, the IMF enlists Ethan's help in order to go on this mission. Mission: Impossible II was directed by John Woo. Tom Cruise and Paula Wagner both served as producers to the film. The screenplay was written by Robert Towne and the story was written by Ronald D. Moore and Brannon Braga. Mission: Impossible II is currently available to watch and stream, download, buy on demand at IFC, Amazon, Vudu, Google Play, iTunes, YouTube VOD online.